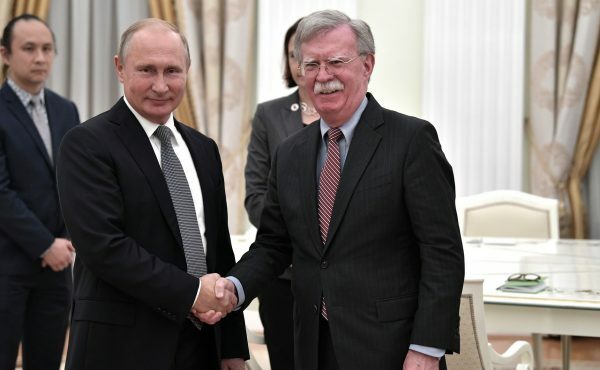 Russian President Vladimir Putin has told US National Security Advisor John Bolton in Moscow that a meeting with President Donald Trump would be constructive in order to bridge differences, most recently about a critical nuclear arms treaty. Bolton arrived in Moscow two days after Trump announced that he would pull the US out of the 1987 Intermediate-Range Nuclear Forces Treaty (INF) because of alleged Russian violations. “Naturally, it would be useful to offer direct dialogue with the president of the United States, first of all, on the sidelines of upcoming international events, say, in Paris,” Putin said in reference to the 100-year commemoration of the end of World War I in Europe. Meanwhile, Russian Defense Minister Sergey Shoigu, who met with Bolton on Monday, said that both countries needed a “more active dialogue” modeled after their cooperation in such “hotbeds of tension” like Syria. “Even small steps will benefit our relations and help restore trust”, Shoigu told Bolton during their earlier meeting. Trump later clarified that this could also include the Chinese and anyone else threatening global security. China is not a signatory to the INF. However, Bolton has stressed that no steps have been taken. Earlier in the week, there was a backlash as global leaders past and present criticized the US move saying it reduced global security. Past US administrations have accused Russia of violating the treaty but never made public announcements they would withdraw. Russia has vehemently denied violating the INF and instead said it was the US that was in violation.